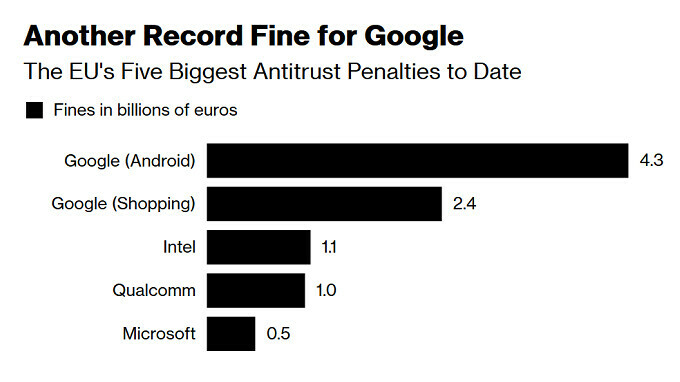 Last week, we told you that Google had been fined the princely sum of $5.04 billion by the EU. The EU Competition Commission found that Google violated antitrust regulations by requiring that phone manufacturers install certain Google apps on Android phones (like Search and Chrome), pay these manufacturers to limit the installation of Search apps on their phones to Google Search, and ban the release of handsets using unapproved versions of Android. According to a report published today, Google's secret attempt to settle with the EU failed because the company waited too long to offer a settlement plan. The dispatch from Bloomberg reveals that last August, after being fined a then-record $2.4 billion euros ($2.7 billion USD) in a separate case involving the EU, Google attempted to reach out to the European Union Competition Commission headed by Commissioner Margrethe Vestager. In a letter sent to the Commission, the company outlined some broad ideas to make the antitrust case go away. In the letter, Google said that it would make changes to its contracts with phone manufacturers giving them more options in regard to their use of Android. This would make these pacts less restrictive in line with the EU's thinking. The letter also contained two plans to distribute apps to the manufacturers in new ways. Google never received a response from the EU about the possibility of settling. According to Commissioner Vestager, Google had sent its letter about a year too late. She said that the company should have responded immediately after it received the initial complaint from the EU. "That didn’t happen in this case and then of course it takes the route that it has now taken. So no surprises," the commissioner said. In addition, the EU Competition Commission felt that the letter was not convincing. Google has announced that it will appeal the fine, which amounts to a little more than 10% of Google's annual take from mobile ad sales. Now every country should start fine google.... for it's dirty tricks. We need something new... iOS and Android feels boring. Want to see new OS like YunOS (2nd largest OS in china...google don't want the world to know about it) and TIZEN to be at next level. WE NEED NEW MOBILE OS. like seriously, who are "we"?? Are there a group of people behind you? There are many OS, that developers are not supporting the platforms, that is something else. I find the title misleading, a secret attempt makes it sound unethical. While you can always file for a settlement in these situations. Nothing secret about it. Now, the truth comes out. It's not about the people of EU; it's all about the money. Google needs to just pull out those markets. I don't get it: EU found out Google's illegal practice 3y ago, it told Google to fix it, Google had 3y to do it but it didn't... who's the blame, Google? Just pay the money and shut the f up. Typical Eurotrash responce. Illegal in the eyes of who? Does the EU expect Google to spend billions developing Android to give it away for free to OEM's and not expect any return?. This is what they are proposing. This is nothing but an extortionate cash grab from the EU, i suppose they have to recoup the £39 billion they ain't getting from the UK somehow. In the eyes of the mighty European LAWS. EU expects Google - and any other company - to respect EU LAW; if obeying the LAW means spending billions, let Google spend billions (or leave EU market, which is worth tens of billions for Google). GB will pay the money it owns EU; if not, EU can simply close its market for GB's products - or it can impose such taxes that no EU consumer will buy them - and switch all related services in other EU countries, which will further destabilize GB. I'm not sure British people understand the price they have to pay and if they are be willing to pay it. Firstly the UK does not owe that money,it offered to pay it as part of a divorce settlement, no deal then no £39 billion. if a hard Brexit happens then WTO rules automatically kick in and have to be adhered to by both sides, try taxing those. The EU has far more to lose as it exports far more to the UK than vice versa, especially Germany, France and Holland. As for the UK not understanding life without the EU, then I don't think the EU understands what it will be like to have a giant tax haven with free trade to the rest of the world sitting on it's doorstep. I'm curious: you are a British citizen that voted for (or is in favor of) Brexit? Because if you are, you have been f**ked up by dumb f**k politicians... Brexit is going to cost EU some money - reallocation of different agencies (like the one for medications), projects that both parties agreed to finance (just like EU is liable to pay for projects it agreed to finance in GB), further more, being an outsider, GB's citizens could no longer hold assets (cash and property) in some EU countries. Every country - except those that have embargoes imposed by WTO and other international organizations - is free to sell in EU market the same way that EU is free to impose import taxes; it's hard enough to sell a €300k Rolls Royce or Jaguar, try sell the same car with €600k and see who buys it; but that is not going to be a big problem, the problem is selling things from London, when LSE becomes irrelevant in EU and oil or gold quotas are going to be set in Frankfurt; London will fight Singapore or Tokyo (btw, did you know that Japan signed a treaty with EU, becoming part in one of the largest markets in the world?) to trade Eurobonds (and who do you think will have the upper hand: GB - 60 mil people, €3b GDP or Tokyo - 120 mil people, €5b GDP?) and EU companies are going to be trade on a EU stock exchange. Switzerland has always been a big "tax heaven" in the heart of EU, Netherlands has great laws for companies, there's Luxembourg (which tighten its rules a bit), Cyprus; there are countries with low taxation like Bulgaria, Romania, even Poland. GB is a important European state and both GB and EU will be affected by the breakup, but nobody can force British people to be a part of a united Europe. EU is going to build itself around its European values, GB (if Scottish, Welsh and N. Irish people are going to let it remain big) will build itself around its British values. Cheers! BTW: yesterday Bloomberg announced that half of euro clearing activities of Deutsche Bank have been moved from London to Frankfurt; you are going to say "Deutsche means German, so it was expected"; you are right, except that 29 banks - including BNP (French), JPMorgan (US), which are ones of the biggest investments banks in the world - already signed with DB, City is relocating its activities to Paris etc. €1tn was moved every day through London until Brits voted for brexit, now other stock exchange markets in EU are having their operations doubled (or grew 10 times in the case of DB). Follow the money and you'll understand why pro-brexiters are just dumb asses. 39 billion? What nonsense amount is that? UK's net contribution was around 9 billion. And sure Google may expect something in return, but they can't use Android to keep their dominant market share in search. You don't hear the EU about making Maps or other apps mandatory. Somehow, Microsoft survived this same thing back in the 90s. Google will be OK.